1. 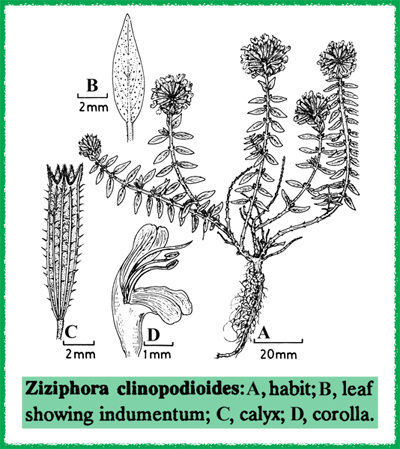 Ziziphora clinopodioides Lam., Illustr. Gen. 1: 63. 1791. Benth. in DC., Prodr. 12: 117. 18 Boiss., Fl. Or. 4: 585. 1879; Burkill, Work. List Fl. Pl. Baluch. 60. 1909; Mukerjee in Rec. Bot. Surv. Ind. 14, 1: 117. 1940; Hedge in Notes Roy. Bet. Gard. Edinb. 23: 215. 1961; Stewart, Ann. Cat. Vasc. Pl. W. Pak. & Kashm. 638. 1972; Rech. f., Fl. Iran. 150: 481. 1982; Tuljaganova in Vvedensky, Conspect. Fl. As. Med. 9: 156. 1987. Suffruticose perennial, much branched. Stems decumbent, ascending to erect, 5-30 cm, ± glabrous, pilose to villous. Leaves elliptic to lanceolate, 10-15 x 2-5 mm, glandular punctate below, ± glabrous to pilose. Inflorescence terminal, ovate-globose, c. 15-20 x 15-20 mm, ± glabrous to vinous, c. 14-30-flowered. Upper cauline leaves transitional into bracts. Calyx 5-6 mm, narrow tubular with short ± connivent linear-lanceolate teeth, ± glabrous to densely villous. Corolla white, pink to mauve, 8-11 mm; tube included within calyx in male-sterile flowers, shortly exserted in hermaphrodite flowers. Nutlets pale brown. Described from Siberia (? type in P). The extreme polymorphism of this species (s.l.) throughout SW Asia is well-known. In Pakistan, unlike other areas, the variation is relatively limited and only two variants are recognized here. Although I have followed Rechinger’s Flora Iranica treatment by recognizing two subspecies in our area, this stems more from convenience than a belief in the reality of two discrete taxa (cf. Hedge, 1961 and Rechinger, 1982). It would be a very suitable species for biosystematic and field studies by local botanists.